Well fall has officially arrived in Indiana this week. Monday the weather was mid-80 degrees outside and then by Wednesday the weather shifted and by Thursday the high was mid-50 degrees. It was a big shift and needless to say it finally feels like a cool, crisp autumn day outside. With this shift to cooler temperatures there are variety of fall-themed food items that start making their appearance in grocery stores this time of year. I love the pumpkin flavoring and of course baked apples. I wanted to talk about some of these fall flavors and tease out what some potential health benefits would be for these food items. Pumpkin - You can find so many different types of pumpkin flavored food items, from bagels, to cream cheese and even your coffee can have pumpkin flavoring. Most of these pumpkin flavored food items are not any healthier than their regular food alternative. The health benefit that is gained from pumpkin is from eating fresh pumpkin puree and putting that in food items. The deep orange color that you commonly see in pumpkins signifies a large amount of carotenoids. Caroteniods act as antioxidants and can be converted to Vitamin A. The Vitamin A is helpful for eye sight and prevent the growth of cancerous cells. Antioxidants are helpful in decreasing inflammation in the body and protect from free radicals throughout the body as well. Cinnamon - This spice comes from tree bark and is very fragrant and this smell is due to the oily part of the bark that releases that smell. This spice is loaded with antioxidants to help protect from free radical damage in the body and can act as a natural preservative. There have also been some studies showing that cinnamon could help with cholesterol levels and reducing high blood pressure or helping with blood glucose control (need to consume 2 teaspoons/day). From the initial research, you have to consume a large amount of cinnamon (120mg/day) and I am not sure that is realistic for the average person. 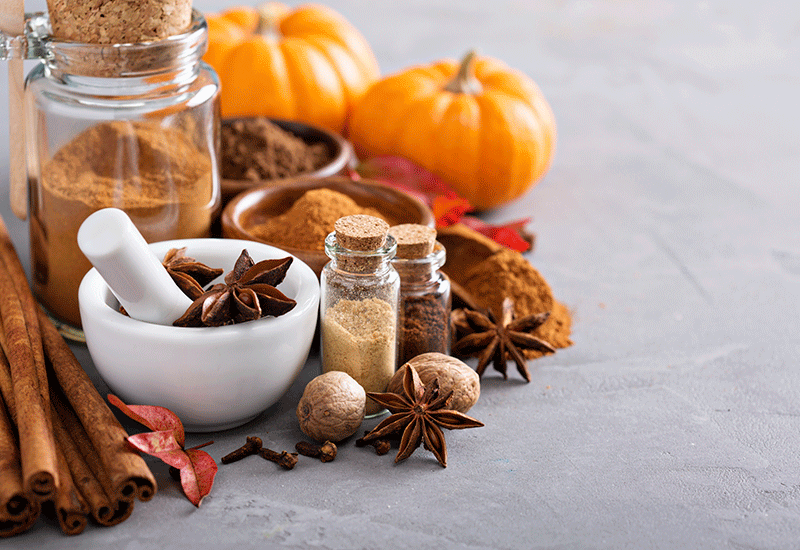 Some cinnamon can definitely make whatever you are making taste good, but I am not sure I would bank on a large antioxidant intake from what you sprinkle on your coffee. Cranberry - These deep red colored berries are commonly seen around the grocery store this time of year. This little berries are packed full of Vitamins C, A and K and are low in calories. They are also rich in proanthocyanidins, which are an antioxidant that help to fight off diseases. Cranberries can help with treatment of kidney/urinary tract infections or other issues. When it comes to dental wellness, the proanthocyanidins help prevent bacteria from attaching to your teeth. These berries are not super sweet so often people add lots of sugar. This is often where the additional calories come from. So try to enjoy your cranberries with limited added sugar. Squash - This is food is technically a fruit and not officially a vegetable. Squash contains high amounts of Vitamin C, Magnesium and antioxidants. This is such a versatile food that can be used as a side dish or a main entree. You can serve certain types of squash cold or warm. This can be a diabetic friendly food, because it has a low glycemic index and isn’t as starching as a potato or pasta. The antioxidants help to boost the body’s immune system and helps with glucose regulation and insulin release. Folate is found in high levels in squash and this nutrient is important for pregnant women to prevent neural tube defects. The potassium amounts in squash are high enough to help with vasodilation and help with blood flow throughout the body and overall blood pressure. Ginger - This spice is popular to add flavor to various dishes and recipes. This spice can be helpful for nausea and helping with morning sickness for pregnant women. Daily consumption of ginger (2g/day) can help with muscle soreness. This isn’t an immediate affect, but can help with soreness over time.It is hypothesized that ginger, like cinnamon, would help with blood sugar control (2g/day) and could be a helpful supplement for diabetics. If you experience indigestion often, ginger could help with this problem. Some further research is needed, but these are interesting findings and might be helpful for some people. These are just a few of the common fall flavors that you might see at restaurants or at the grocery store. Hopefully this information is helpful as you consider any of these food items and their health benefits.